12/13/2016 Update: After a brief hiatus and some new upgrades, the Arkalight is back! Enjoy! Our past office projects have been more about collecting data, for example our coffee maker and popcorn machine, but displaying data is just as important as collecting it. At Arkatechture we mainly use tableau for our visualizations, but interactive, real world visualizations are just more fun. So below is our newest in-house visualization tool. 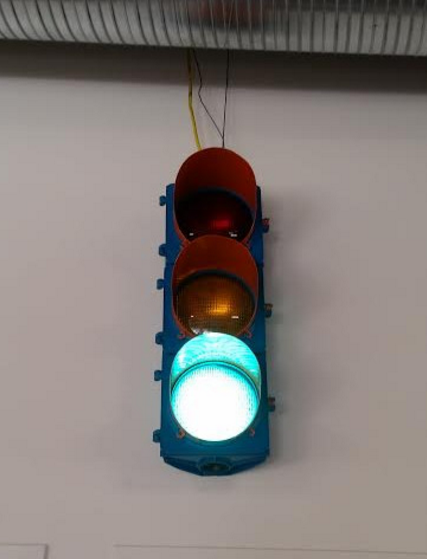 Currently hanging from one of our metal support beams is a retired traffic light with a raspberry pi running Nodejs, and of course we spray painted it with Arkatechture colors. And YOU can control it! The best part about our traffic light is that for now, it’s publically accessible. Just go to this webpage and read the instructions to control it and watch on the embedded dropcam feed. The traffic light runs on mains (120v in the United States), so you need to be careful when it’s plugged in, and do not try to work on the internals while it’s powered. Running on the RPi is a NodeJS server that changes the state of the relay based on calls to a REST api on the server, the code you can find on my Github account here.